Canonical has announced the launch of its very first Ubuntu-based smartphone, but for those who remember the promise of the Ubuntu Edge its mid-range specifications may disappoint. Surprising everyone with just how accurate the rumour-mill has been over the last few months, Canonical announced its partnership with Spanish mobile giant Bq to launch the Aquaris E4.5 Ubuntu Edition handset next week. Based on the existing Aquaris E4.5 Android-based hardware, the Ubuntu Edition varies little in its specifications: a MediaTek quad-core 1.3GHz processor is paired with 1GB of RAM and 8GB of storage - micro-SD expandable - behind a distinctly entry-level 540x960 qHD IPS display. Compared to the promised specifications of the Ubuntu Edge, which failed to reach its impressively sky-high crowdfunding goal last year, the Aquaris can hardly fail to disappoint. While the hardware is nothing special, it's the software Canonical wants buyers to concentrate on. Based on its Ubuntu 15.04 Linux distribution, Ubuntu for Phones brings with it a new user experience the company claims is revolutionary: scopes. Described by the company as 'a new UI paradigm,' scopes are designed to deliver content from various applications directly to categorised home screens - meaning video content from various applications appears on the video screen, music content on the music screen, and so on, regardless of the vendors of each individual application. Sadly, one of the biggest features of the Ubuntu Edge promise has not made it to launch. 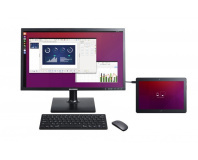 During a press briefing, Cristian admitted to us that the Bq Aquaris E4.5 Ubuntu Edition will not support connection to external displays and keyboards for use as a desktop-class device, a major selling point of the Ubuntu Edge concept, but claimed that Canonical was still very much investigating the possibility with a view to bringing such convergence to future device launches. 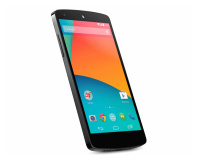 Bq is to launch the Aquaris E4.5 Ubuntu Edition on Monday as part of a 'flash-sale' programme which will see the handset made available in small quantities over the coming weeks as production ramps up. Pricing has yet to be formally confirmed, with Bq's Rodrigo del Prado stating that it will be within €10 of the Android version's €169.95 price SIM-free. Initially, the device will be exclusive to Europe with international launch plans yet to be announced.